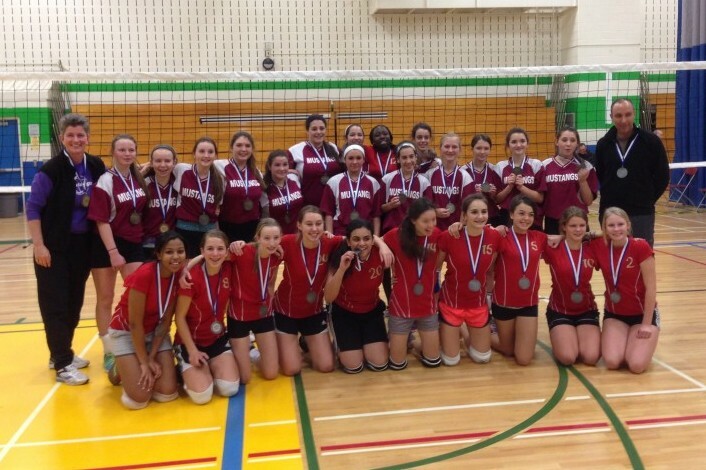 WATERLOO, Ont (January 17, 2014) – The Monsignor Doyle Mustangs are champions again as they claimed the 2013-14 District 8 midget girls volleyball crown last Monday at St. David Catholic Secondary School in Waterloo, Ont. Monsignor Doyle earned a perfect 4-0 record en route to the their second championship in as many years. They edged Resurrection 2-1 in the championship final splitting the first two sets (18-25, 25-13) and then taking the final set with a decisive 15-7 win over the Phoenix. Resurrection for their part took silver collecting an impressive 3-1 record earning top position in Pool B with their only blemish coming against the Mustangs in the championship. In their first ever season competing in midget girls volleyball, Woodland CHS grabbed third place winning the consolation final 2-0 over St. Mary’s (Set scores were 25-12 and 25-8). Other teams at the event included host St. David’s and a second team from St. Mary’s. The midget girls volleyball season runs just prior to the holiday break in December with a D8 championship taking place in January. Scores in the regular season are not kept as the league is designed to focus on skill development with the goal of improving game play and graduating players to the junior squad next season.